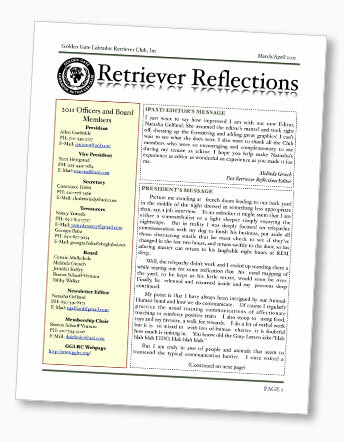 Our Club publishes a Quarterly newsletter, Retriever Reflections, which is sent to members via US Mail and is also available for online viewing for our members in the Members Only directory. Archives of past issues are also available. This valuable resource for labrador owners & breeders is full of information, from club actiivities to litter listings and judges' comments from our Specialty. Take a look at a sample newsletter and consider joining our club to get the current issue! The newsletter is published Quarterly. Contributions of photos, articles, graphics, and any other interesting dog-related information is most welcome. Contact Lorrie Bellows, our editor for more information.